server and many others. Make regular scans to get a list of current issues that may raise and read suggested solutions to avoid or clarify them. 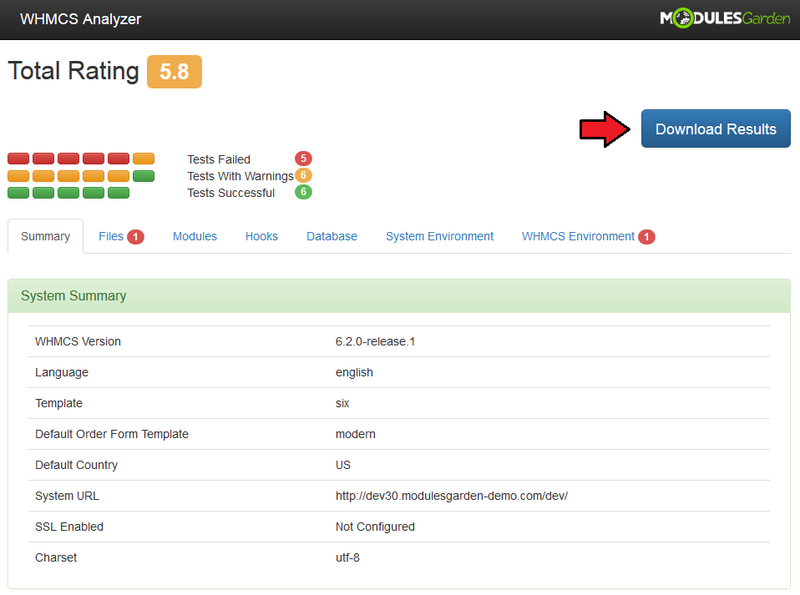 This tutorial will show you how to successfully install and configure WHMCS Analyzer. 1. 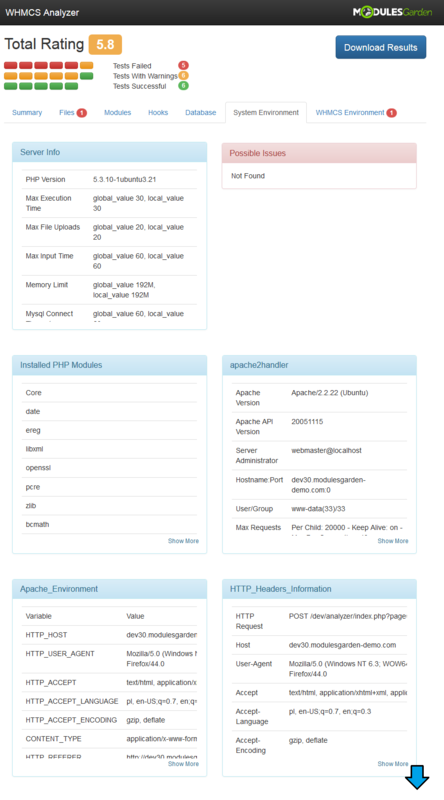 Log in to our client area and download the script. 2. 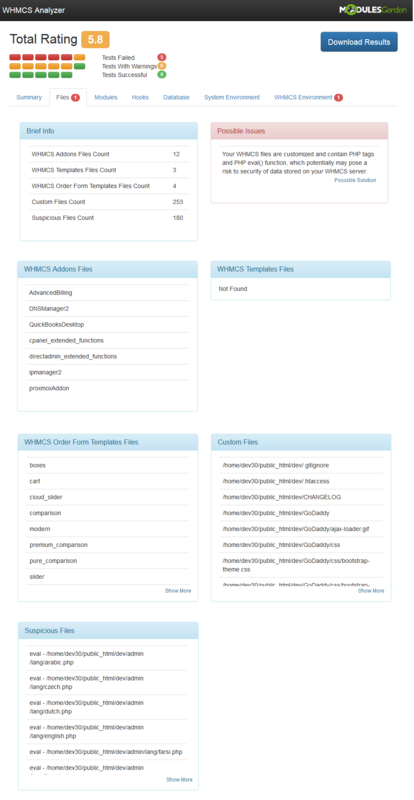 Upload and extract the files into the main WHMCS directory. 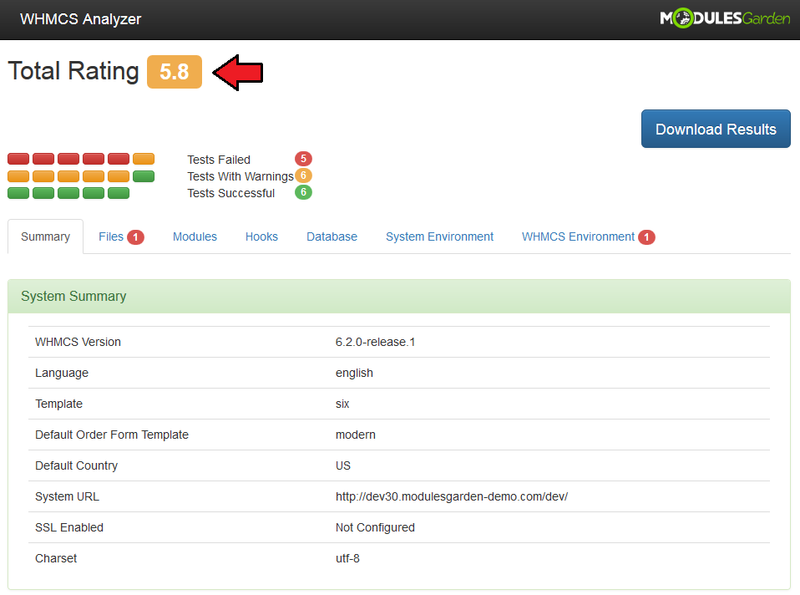 The current version of the WHMCS Analyzer module does NOT support WHMCS V7. 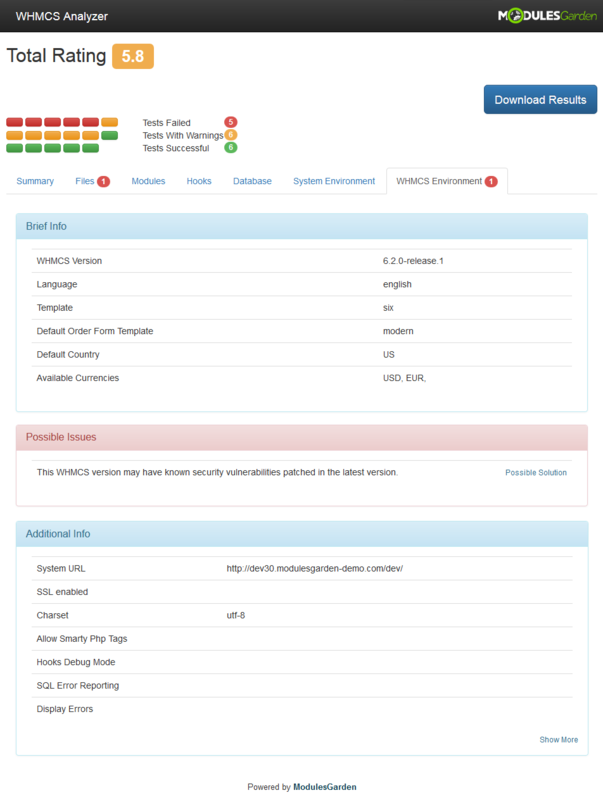 It is not recommended to use the module with WHMCS V7 and later as errors are highly probable. The updated version of the module is sure to be expected. 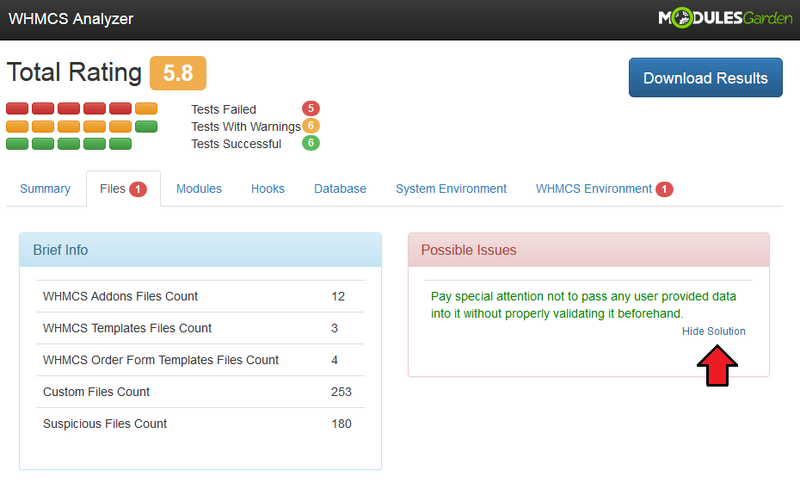 Files in your WHMCS directory should look like on the following screen. 3. Now you have to allow access to 'analyzer' and 'temp' files, change access rights as writable. 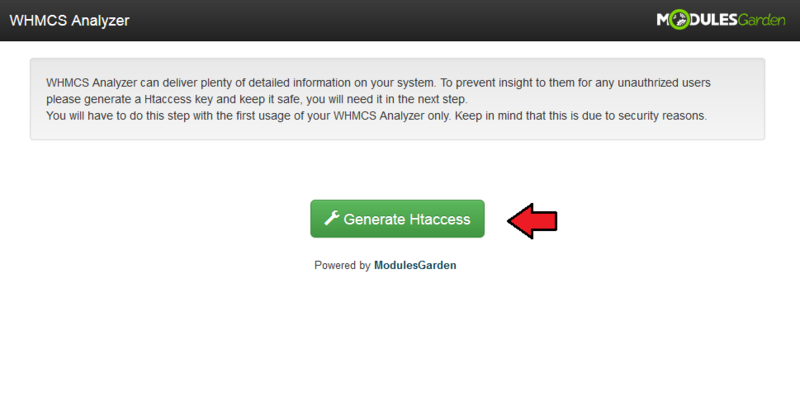 Proceed to 'YourWHMCS → Analyzer'. Set access rights to the mentioned file as writable. That is all, you may move the script itself! 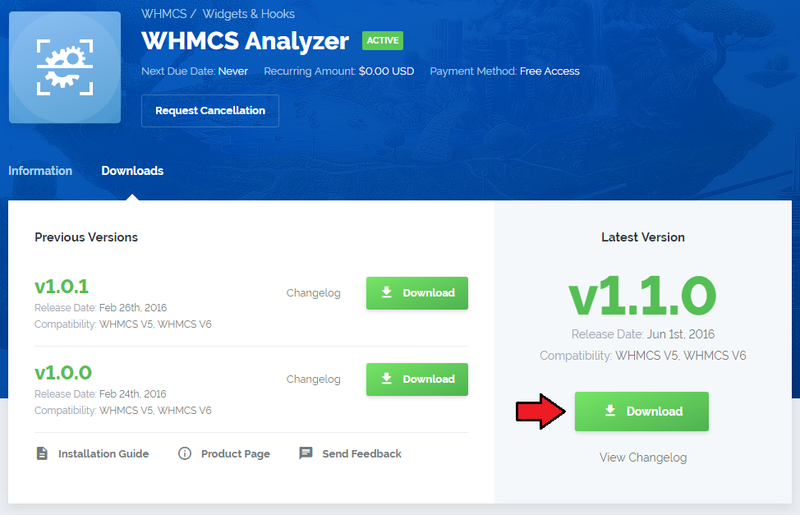 WHMCS Analyzer is a disparate product that works outside of your WHMCS system to provide you a comprehensive view on its every single aspect. In the very beginning you will be asked to generate htaccess. This step is obligatory due to security reasons. You will be asked to do that only when using the script for the first time. 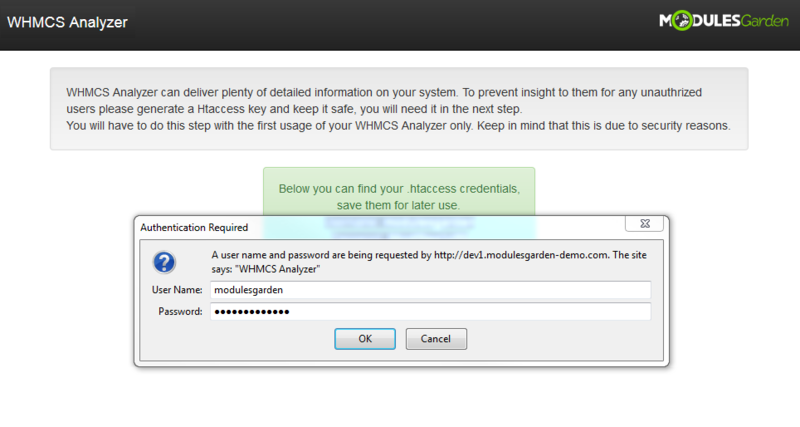 Please note the generated username and the password, you will need them in the next step to get access to the product. 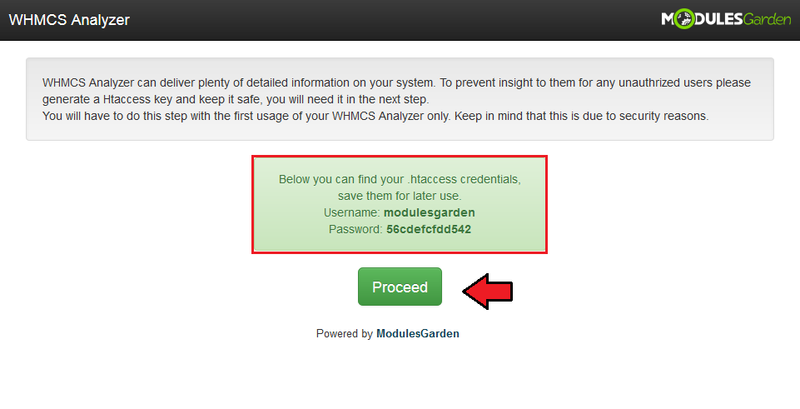 Now, type in the generated in the previous step username and password to continue. That's it! You may finally scan your system. Press 'Start Scanning' button when such appears. Wait a moment until every part is completed successfully. 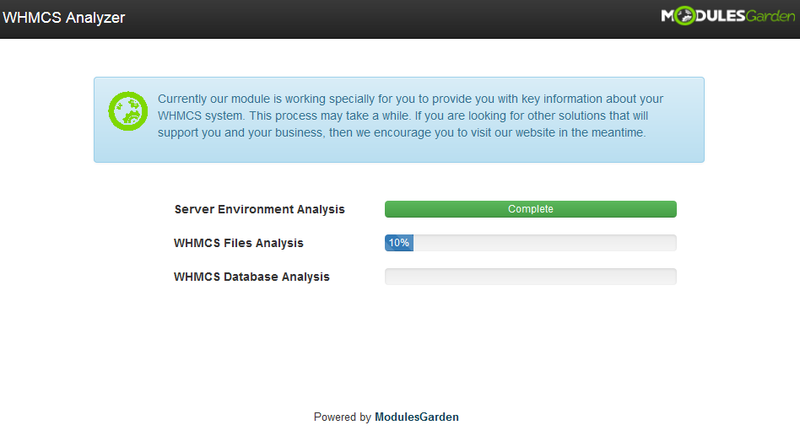 When the analysis process has finished successfully, a full summary will be displayed on your screen. Read the below section to get a full view on data you will find there. 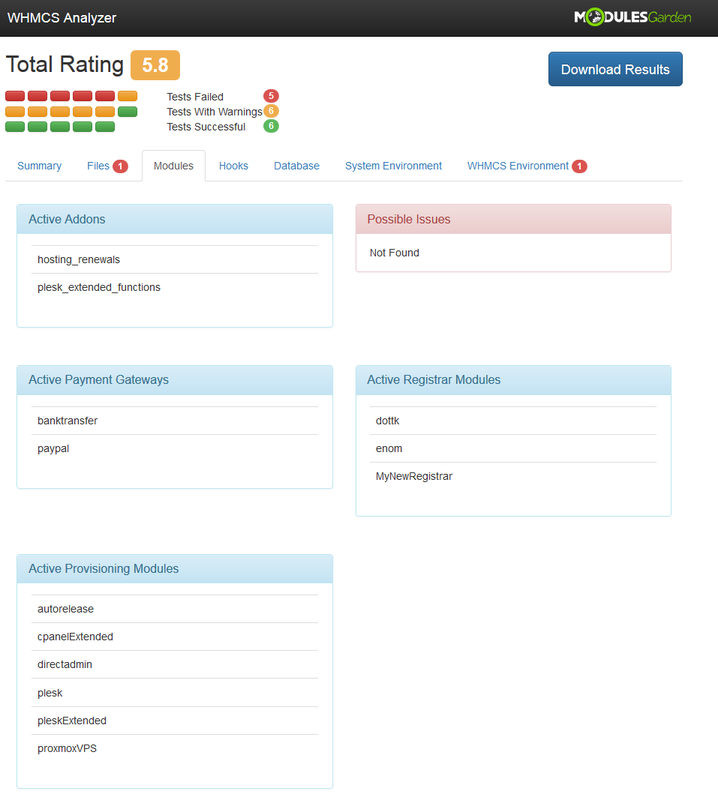 As a very first piece of information you will find 'Total Rating'. This is an objective evaluation of your system as a whole. The highest possible rate of any system is 6.0. If you have a lower grade, then your system probably lacks in some of the below features. 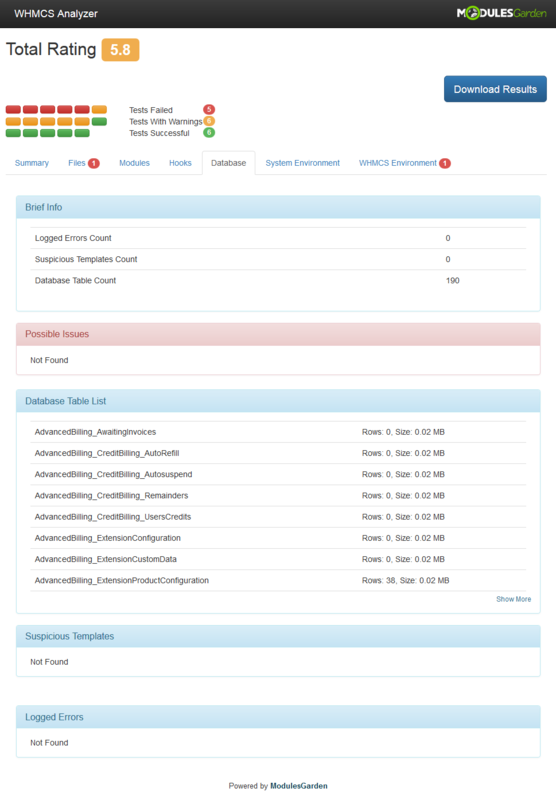 in your WHMCS usage. It is important to always analyze them carefully and clarify if possible. In some cases we try to suggest the best action to prevent or solve the issue. Press 'Possible Solution' to see it, 'Hide Solution' if you are already familiar with it. This section is very short but clear. There is a list of all active addons, payment gateways, registrar and provisioning modules. Again, possible issues if such exist. 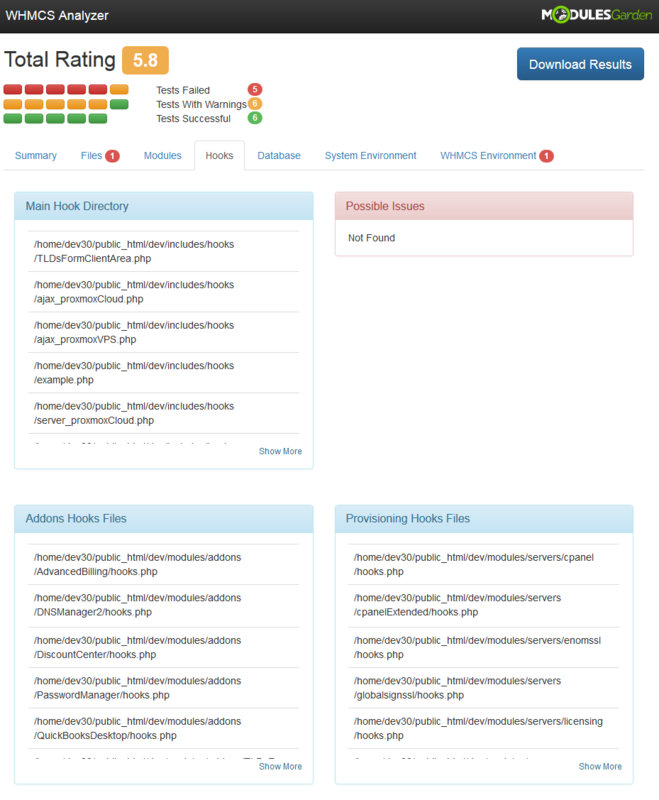 See details of 'Main Hook Directory', 'Addons Hooks Files' and 'Provisioning Hooks Files'. Additionally, there is again a 'Brief Info' and 'Possible Issues' sections with suggested solutions. Please note that below, these are only examples, the results will depend on your system customization. Last but not least section is simple yet very clear. 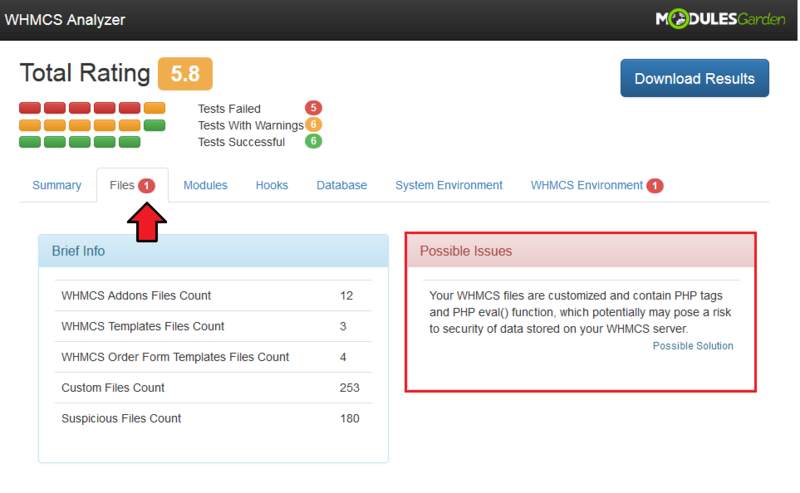 Your 'WHMCS Environment' includes 'Brief Info' and 'Additional Info' boxes and a list of possible issues. If you want to save your scan results you may download the current analysis. Press 'Download Results' button to save the results in a ' .PDF' file. If you decide to save the results after each scan, it will be possible to easily compare them and see any changes in your system. 1. Due to a huge size of 'System Environment' section, we advise to use 'Ctrl+F' keys shortage to look for precise information. 2. In case you encounter an error like on the screen below, please make sure you have completed step three of our installation instruction. 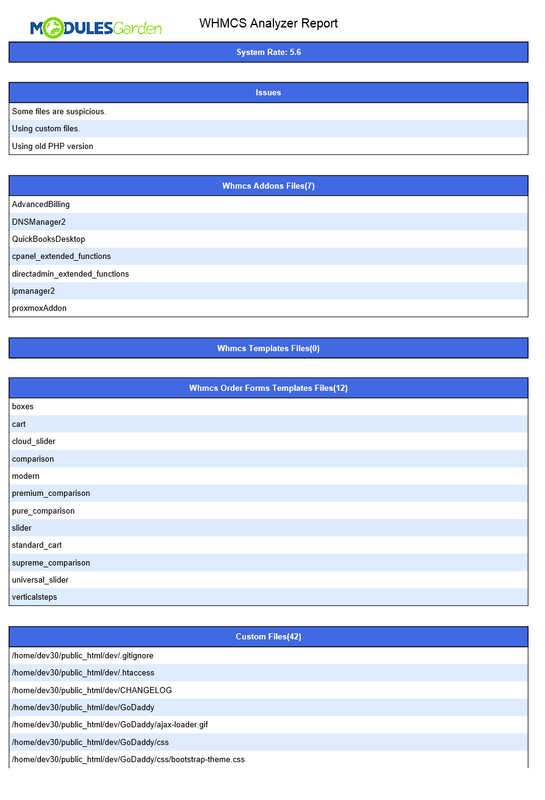 This page was last modified on 17 April 2019, at 17:47.